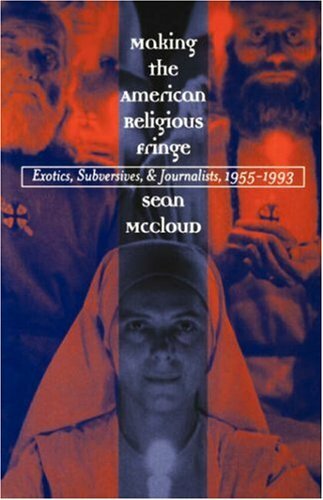 In an examination of religion coverage in "Time," "Newsweek," "Life," "The Saturday Evening Post," "Ebony," "Christianity Today," "National Review," and other news and special interest magazines, Sean McCloud combines religious history and social theory to analyze how and why mass-market magazines depicted religions as "mainstream" or "fringe" in the post-World War II United States. McCloud argues that in assuming an American mainstream that was white, middle class, and religiously liberal, journalists in the largest magazines, under the guise of objective reporting, offered a spiritual apologetics for the dominant social order. McCloud analyzes articles on a wide range of religious movements from the 1950s through the early 1990s, including Pentecostalism, the Nation of Islam, California cults, the Jesus movement, South Asian gurus, and occult spirituality. He shows that, in portraying certain beliefs as "fringe," magazines evoked long-standing debates in American religious history about emotional versus rational religion, exotic versus familiar spirituality, and normal versus abnormal levels of piety. He also traces the shifting line between mainstream and fringe, showing how such boundary shifts coincided with larger changes in society, culture, and the magazine industry. McCloud's astute analysis helps us understand both broad conceptions of religion in the United States and the role of mass media in American society.